Since Ed Brubaker brought Barnes back in his epic run on Captain America nearly a decade ago, Bucky has quickly ascended the ranks of Marvel fandom to become one of the most prominent and complex characters of the entire canon. Perhaps due to his elevated status as the result of the recent Captain America: The Winter Soldier film, or perhaps because the character is just so damn cool, Marvel has launched a brand new Winter Soldier comic book in the aftermath of Jason Aaron’s acclaimed Original Sin crossover. The premise is simple: Nick Fury used to be “the man on the wall” who would protect the Earth from intergalactic and celestial threats by killing them before they came to kill us, but now it’s Barnes’ job, and he’s coping. Said “coping” includes recruiting a partner—cult favorite Daisy Johnson, aka Quake—and breaking up an undersea drug ring with an old Invader’s buddy. And writer Ales Kot and artist Marco Rudy relish turning what would otherwise be a space-hopping noir into an absolute acid trip of intergalactic hallucinatory escapades. For real. 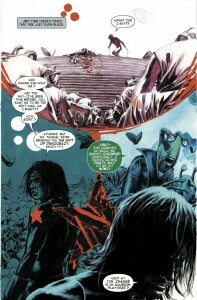 Bucky Barnes: The Winter Soldier is an absolute trip from start to finish, both in terms of the script and the artwork. Marco Rudy’s innovative, surrealist aesthetic is absolutely stunning, though there are times when I literally could not comprehend what the f**k was happening. Rudy has absolutely no concern for paneling or logic in his visual storytelling, instead focusing on ambiance and abstraction as he captures the operatic scope of the universe in this book. For the most part, it works, making for a trippy, spacey visual experience from start to finish. There are, however, some serious narrative consequences to the abstractions in the art, particularly the final cliffhanger page. I think I know who we’re looking at, but I can’t be sure, making for what could be a powerful moment a bit indecipherable. Buy. 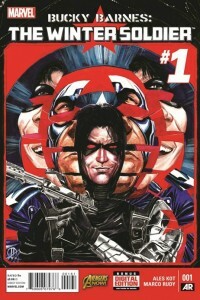 Bucky Barnes: The Winter Soldier #1 is an absolute trip from cover-to-cover. 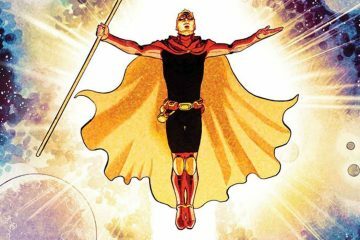 I mean, it’s a former sidekick from WWII dressed in Soviet assassin garb floating around in space executing gods and alien terrorists: what’s not to love? Or at least completely lose your mind over? Ales Kot and Marco Rudy have captured a new energy for one of the most complex and important characters of the last decade, and I’m excited to see where it goes over the next few months! PS – I freaking love Bucky Barnes. Did I mention that? But this is definitely not Brubaker’s noirish Winter Soldier; this is something completely different… and very very engaging. Check it! I picked this up because I, too, love Bucky Barnes. 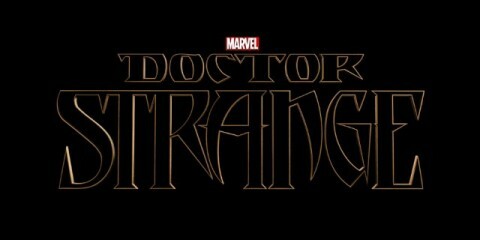 It was very different in terms of the storytelling and art, but I liked it a lot and am definitely intrigued for more. This is a comic I’ll have to spend a little more time reading just to be sure I get everything, though.